The sad thing about scuba diving is that eventually, we must return to the surface. Some divers think the dive is over when they give each other the “thumbs up” signal indicating it is time to go up. However, prudent divers know the dive isn’t finished until you are safely onboard the boat or are exiting the water onto shore. The ascent, if not performed properly, can potentially put a diver at risk of injury. Coming up too quickly can increase the chances of lung overexpansion injury and/or decompression illness. It is important to use the proper techniques for safe ascents. Regardless of whether you are diving from shore or boat, shallow or deep, most dives end with a vertical ascent to the surface. To make a perfect ascent, consider it a two-part process: part one is from diving depth to safety-stop depth (or depths) and part two is from the shallowest safety stop depth to the surface. Before the dive, you and your buddy agreed on a dive plan. Begin the ascent process when one of you reaches a previously agreed-to tank pressure, when you are near the planned bottom time or when your dive objective has been fulfilled. [ONE] Monitor your gauges and computer often and be aware when it’s time for you and your buddy to begin the ascent procedure. Upon checking your gauges and noticing it’s time to begin the surfacing process (Photo 1), give your buddy the “thumbs up” signal and then make sure to get an “OK” signal from them indicating they are preparing to ascend with you. [TWO] If you are carrying a camera, light or other handheld accessory, consider investing in an accessory clip that will allow you to secure the item to a D-ring on your BC before you go up so you can use both hands for ascending. A safe ascent involves using both hands. Use one hand to keep your gauge console and/or wrist computer in sight. Use the other hand to vent a small amount of air from the buoyancy compensator (BC) by pulling a dump valve or pressing the deflate button on your auto-inflate/deflate hose. If you are carrying a camera, light or other handheld accessory, consider investing in an accessory clip that will allow you to secure the item to a D-ring on your BC before you go up so you can use both hands for ascending (Photo 2). The staff at your local dive center can help you select the perfect clip for the job. 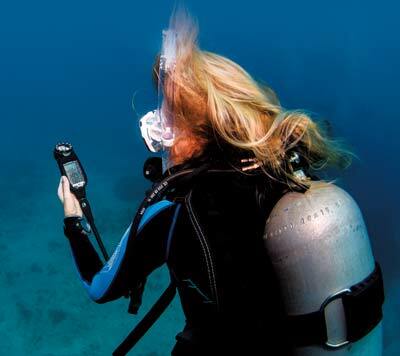 Practically every diver today uses a dive computer. Some dive computers are programmed to include a “deep stop” — a safety stop for a minute or more at half your maximum dive depth. For instance, on a dive to a depth of 80 feet (24 m), your computer might indicate that you should make a brief safety stop at 40 feet (12 m) for one or two minutes before ascending to your final safety stop at about 15 feet (5 m) for three to five minutes. Check your computer’s user manual for complete details. 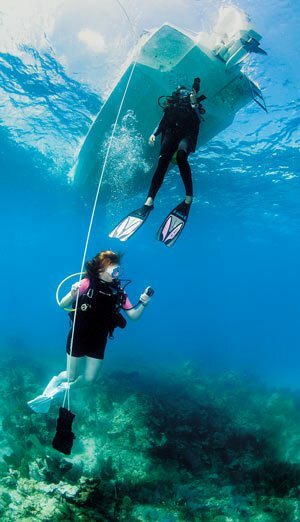 You and your dive buddy should plan to stay near one another as you ascend at a slow, safe rate to safety-stop depth, venting air from the BC as necessary. While an ascent rate of 60 feet ( 18 m ) per minute was once standard, we now know that slower is better. An ascent rate of 30 feet (9 m ) per minute — or slower — is beneficial. When you are performing a shallow safety stop at about 15 feet (5 m), it is important that you and your buddy remain aware of your surroundings. Look upward and around you. Listen for boat motors and look to the surface for boat traffic or obstructions. Currents and surge can make the shallow safety stop challenging. Many dive boats deploy a weighted hang line or bar over the side of the boat, which you can hang onto or use as a reference point to help you maintain safety-stop depth (Photo 3). If such a line isn’t available, you might also make use of a boat’s anchor or mooring line, although use caution if the mooring line is heavily encrusted with growth, as some marine life can produce a stinging sensation when touched. [THREE] Currents and surge can make the shallow safety stop challenging. 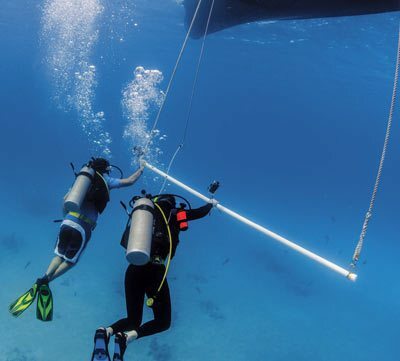 Many dive boats deploy a weighted hang line or bar over the side of the boat, which you can hang onto or use as a reference point to help you maintain safety-stop depth. Many safety-conscious dive charter operators routinely stage a spare scuba tank and regulator at safety-stop depth for your use in case you run low on air while performing a safety stop. There’s no shame in taking advantage of this extra air. It is there for you to use if needed, so don’t ever be timid about staying safe. 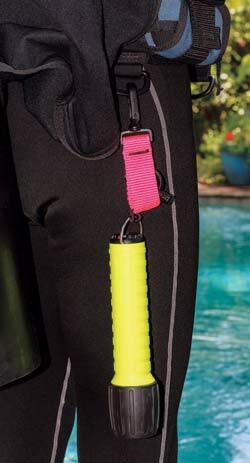 If you are live boat diving, also called drift diving — where the boat does not anchor or moor up, but rather motors in the vicinity of the divers, following their bubbles — using a safety sausage and reel will assist you in maintaining the proper safety stop depth. Avoid pulling down on the reel line in an attempt to maintain your buoyancy. Use your BC for buoyancy control. Keep a bent, relaxed elbow when holding the line or reel. That way, you will maintain your depth and not be pulled up and down by possible wave action. As we said earlier, prudent divers know the dive isn’t finished until you are safely back on the boat or are exiting the water onto shore. However, we sometimes see divers execute a “textbook perfect” shallow safety stop, only to bolt to the surface from a depth of 15 feet (5 m) — sometimes filling the BC on the way up! Don’t do this. Stay focused on safety as you signal to your buddy that you are ready to go up. Together, ascend slowly, while venting air from the BC as needed as you make a slow, controlled ascent to the surface. [FOUR] As you begin your final ascent to the surface, look up and around, checking for any boat traffic. Raise one hand above your head as you ascend the last few feet/meters to the surface. Avoid surfacing underneath the boat. As you ascend to the surface, look up and around, checking for any boat traffic. Raise one hand above your head as you ascend the last few feet/meters to the surface. Avoid surfacing underneath the boat (Photo 4). Inflate your BC, and keep your mask and regulator or snorkel in place as you signal “OK” to the boat crew and await their instructions for exiting the water.